Last weekend was the start of Christmas fair season for me. 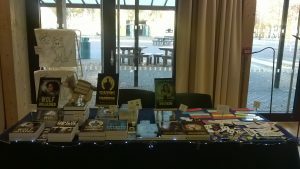 I use these fairs as an opportunity to sell my books as well as a few other items, such as hand-stitched pin badges and bookmarks, which helps to cover the cost of having a table. This fair was one held in a local school and it’s one I did pretty well at last year. One of the highlights of last year was the guy who wanted to buy badges for all of his grandchildren who cleared out half my stock in one go. This year wasn’t quite so successful. 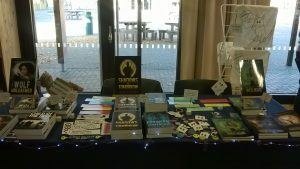 It started out reasonably and I sold three books and some badges in the first hour (including a girl who bought a bi pride badge who then came back to buy a rainbow one for her girlfriend), but after that it got dramatically quieter and I only made one more sale for the entire rest of the fair. I didn’t take it personally because it was quiet for all the stalls around me. The guy across from me selling wooden toys and puzzles looked like he might be falling asleep at times. I did have some good conversations and a few people took cards saying that they would look up the e-book versions, so fingers crossed about that. I also got some chuckles for my new bookmark designs. This was the first outing for my “aliens believe in you” and “always finish what you sta…” bookmarks and both of them amused people, which was what I wanted. I ended up rearranging my stall part-way through. I started out with all the books on one side and all the other stuff on the other, but then I rearranged it so that the books were in three groups with the other things in between. Any thoughts on which layout looks better? Leave your opinions in the comments. It wasn’t my most successful Christmas fair, but I still sold four books that I wouldn’t have sold if I’d stayed at home, so I’m counting it as a win.